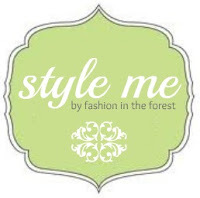 Fashion In The Forest: Style Me! We're back with another segment of "Style Me", where you pick the product & I style it for you! We worked with Sarah of East 9th Street last week, who has a few blouses that she was unsure how to style. Last week we worked with a ruffled black collared blouse from Daniel Cremieux. This week we are working with a lime green cami tank with rosettes, also by Daniel Cremieux. Sarah said that Dillard's is the only major department store in her area & that she really favors the Daniel Cremieux brand sold there. Please keep in mind that I am a budget friendly blogger and all items I use in these style sets are under $50. Links are also provided to where you can purchase these items if you so choose. Below are a few ways I'd style "Blouse #2". So....what do you think? What other ways might you wear this adorable top? I think this blouse is quite versatile; it can go from casual to semi-formal, you just need the right accessories! Would you like to be featured in a "Style Me" segment? I'd love to work with you! If you're interested, please fill out the 'Contact Me' form & I'll get back with you ASAP! I love Lime Time! One question for you, this shirt is quite sheer, what would you wear underneath it so you can't see through it as easily? ?